You might have noticed Google ignoring punctuation and mathematical symbols from a query as it isn’t capable of indexing them and the meaning was rather changed by the index. Therefore, it was little difficult to get exactly what we needed. At the same time, some of the punctuation marks and mathematical symbols are being used to provide the advanced features like colon, quotes, minus sign and plus sign. Besides, you might have noticed recently that Google started showing the results for queries like [. ], [,], [:], [;], [#], [%], [@], [^], [)], [~], [|], ["], [<], [$]. 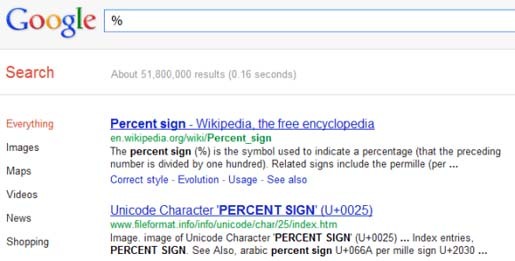 Now, if you search [%], Google will display the results for [percent sign] and that happens irrespective of the interface language, so it's not a synonym generated by Google's algorithms. If you search [:] and you'll get the results for [colon]. Really a nice feature… check it out.